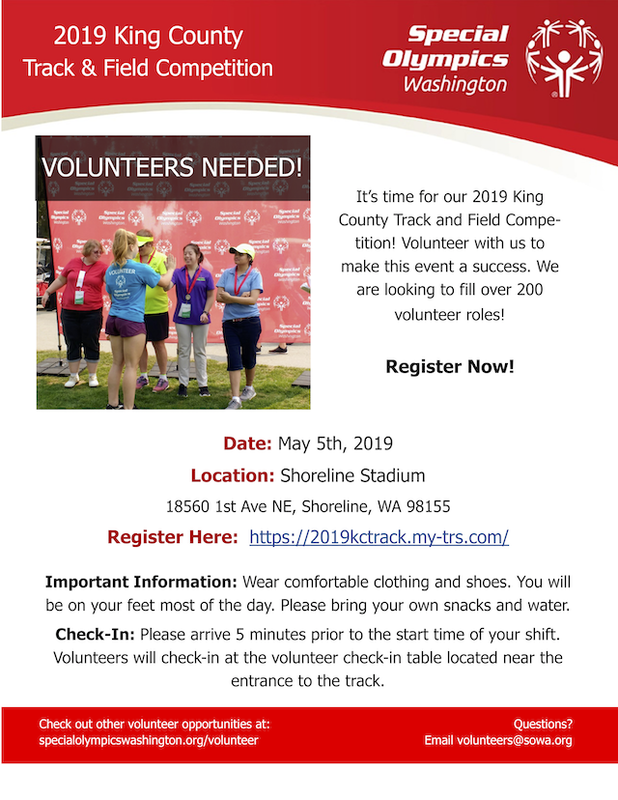 Track and field events for the Special Olympics will be held in Shoreline on May 5, 2019 at the Shoreline Stadium, 18560 1st Ave NE, 98155. 200 volunteers are needed, according to volunteer coordinator Alysanne Stack. But she says there is no sports experience required! Volunteers just need to be comfortable with moving around most of the day and being on their feet. Each person gets to pick their own activity to volunteer for. And each activity is split into shifts (7am-12:15pm, 7am-5pm, 11:45am-5pm) so a person can choose the amount of time they can commit. If you have questions or want to sign up, you can register online or contact Alysanne by email or phone 206-231-6034.